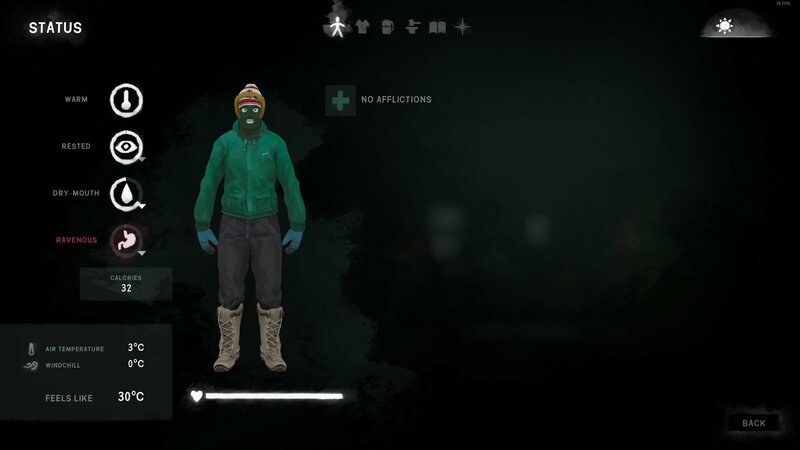 Learn how to get Well Fed in The Long Dark, and find out what benefits there are to doing so. 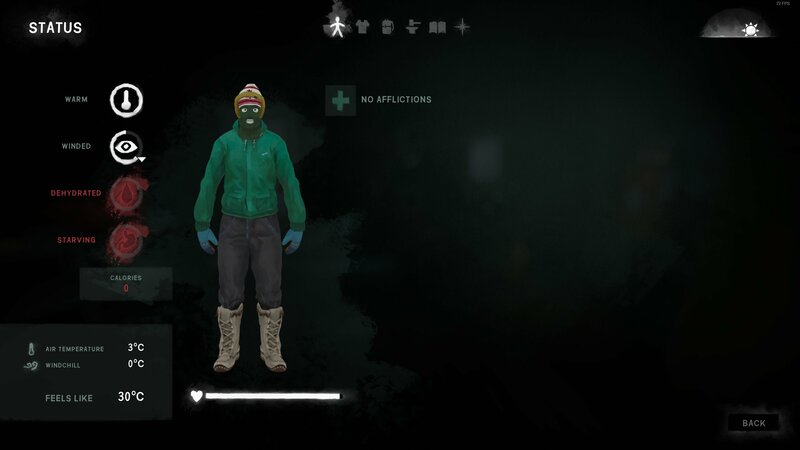 The Long Dark recently received a major update that focused primarily on UI changes and an overhaul to its story mode, but a sneaky little Well-Fed buff was also added, addressing the food and hunger meta in a genius way. Below, I’ll explain what Well Fed is and how it can be used to a player’s advantage. 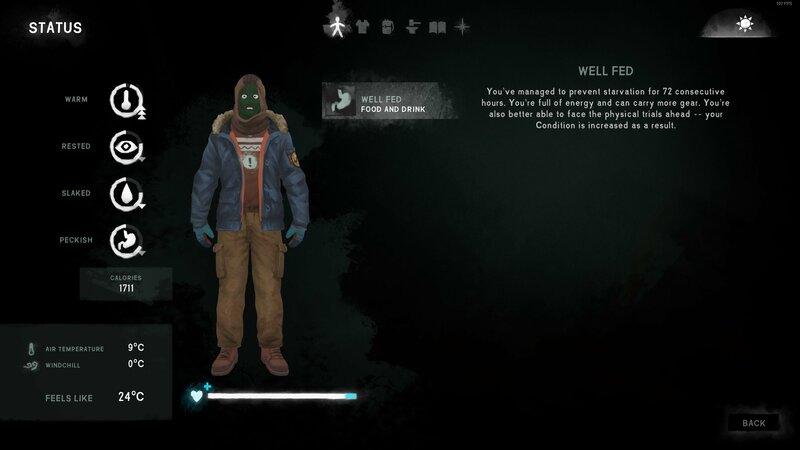 Well Fed in The Long Dark simply means that the character hasn’t been starving in more than 72 hours, or three in-game days. Starving is when a player’s calorie store drops to zero. If there are even a few calories in the player’s stomach, the reading will be ravenous. The goal is to simply ensure that there are always at least a few calories stored. After 72 hours, the player will become Well Fed. However, if the calorie store drops to zero at any point, the timer is reset, and the player must once again maintain at least one calorie in store for 72 hours to become Well Fed again. What is the benefit for being Well Fed? 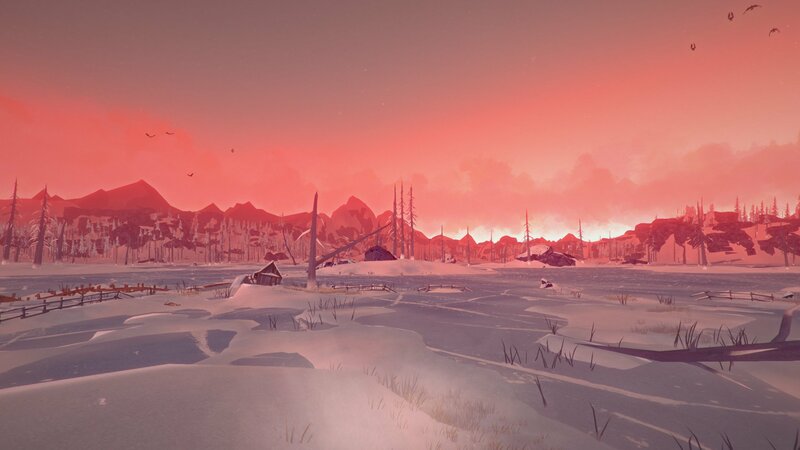 Being Well Fed in The Long Dark is beneficial because it provides the player with five kilograms of additional carry weight, and some extra condition. Considering the default is only 30 kilograms to begin with, this is a huge amount. Imagine having that additional carry weight while moving bases or trying to lug Moose meat back to camp. It’s a complete game changer, especially when stacked with the Moose-Hide Satchel which adds yet another five kilograms of carry weight, potentially giving the player a total of 40 kilograms when Well Fed and carrying the Moose-Hide Satchel. The extra condition is beneficial just by allowing the player to take more damage and survive. This is informed speculation on my part, but the Well Fed buff appears to be a counter to a hunger meta that is widely used by advanced-level players. These players figured out that the character only loses about one percent of their condition per hour while starving. Conversely, the player recovers more than one percent of their condition while sleeping if they keep their calorie store above zero and aren’t dehydrated. A player could starve themselves all day, losing about 12-16 percent condition, eat 800 or so calories just before bed, then sleep and recover all that condition. This keeps the calorie intake of the player minimal, extending runs on the Interloper difficulty. The genius of introducing the Well-Fed mechanic is that it doesn’t punish players who were using the starvation method. That’s a real strategy that someone might use if lost in the wilderness. Rationing is a reasonable way to play. However, providing incentive to keep calories in store at all times allows players to starve if they wish, but rewards them if they go the extra mile and keep their survivor Well Fed. With a complete understanding of how Well Fed works, visit The Long Dark on Shacknews to browse through all our coverage.